At UP | Understand Pain we are really excited to have our second event following the enormous success of the launch in March. 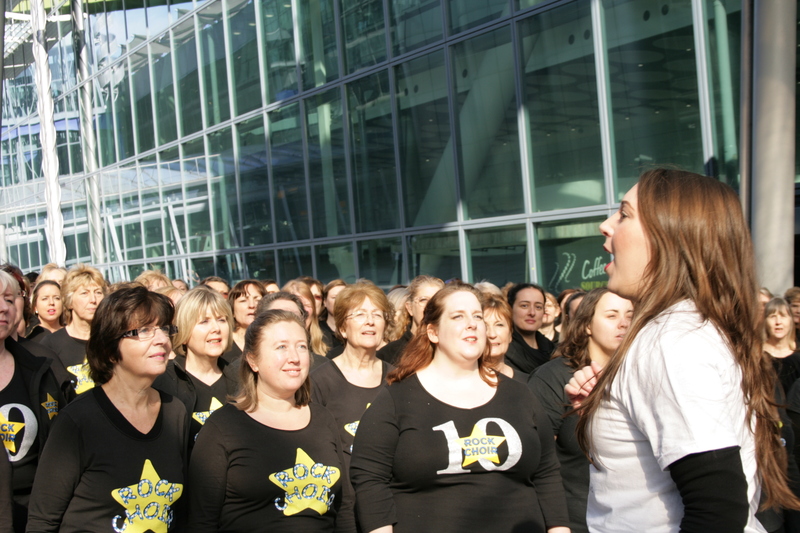 We had hundreds of choir members from Rock Choir, singing out for UP at Heathrow where passengers and staff enjoyed the entertainment at Terminal 5. This time we are going bigger and better with more choirs and a non-stop sing-a-thon, the only breaks being brief talks about UP, what we are doing and why. UP was formed by Georgie and Richmond earlier this year to raise the awareness of the huge problem of pain (back pain is the number one global health burden; in the top 10 of global health burdens we have back pain, neck pain, osteoarthritis and headaches), and that there is plenty that we can do to change and overcome pain, this to resume a meaningful life as exemplified by Georgie herself and many others. One of the biggest problems regarding pain that we face as a society, is the misunderstanding of pain itself. It is still thought of and treated as if the body structures are to blame, i.e. where the pain resides is where the issue exists and where treatment must be directed. Pain science has been telling us for years, since Pat Wall and Ron Melzack shifted our thinking, that there is much more to consider as the biology exists elsewhere in the main. The latest thinking blends science and philosophy to consider pain as a whole person, lived experience — e.g. in the case of back pain, it is the person who feels pain, not the back; much like hunger, it is the person who feels hungry and not their stomach. Start the Pain Coach workshops* with the monies raised so far and from the next event. * more information to follow on Pain Coach workshops. If you are travelling through Terminal 5 or work at the Terminal, come and see us and show your support!! If not, don’t worry as we are filming the event so that the World can see the performances and hear our messages.